Fanzinoteca Ambulant - ZineWiki - the history and culture of zines, independent media and the small press. 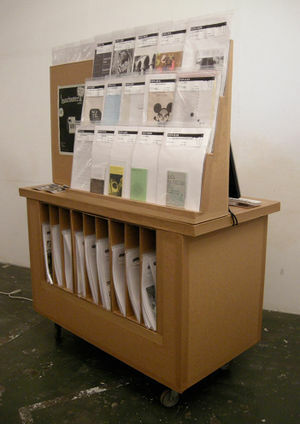 La Fanzinoteca Ambulant is a traveling module for free consultation, which contains an archive of zines, hand made books and other difficult classification issues that emerges as the evolution of "la fanzinoteca Saladestar", a reading room located in Barcelona, Spain, from 2005 to 2007. The intention is to move this module to create public spaces for different points of itinerant consultation and propose parallel relationship about the zine. In parallel, the fanzinoteca conducted a research on such publications, to edit her fanzine Minca and expand its collection. The Fanzinoteca Ambulant has at this time more than 250 publications from over 500 that are part of the bottom of the file. In this module you can find zines like Strange Orange, Smile, Entremettrum, Pigguts, Tom's Fanzine, Chuck Norris, Pez, Garabattage, Minca, Arreplegator, El Naufraguito, La escuela Moderna, All is full of plastic, Space Sioux and more. Module in expansion La Fanzinoteca Ambulant are very interested in expanding this file with the collaboration of the people. This page was last modified on 26 December 2018, at 14:02.